Bharat Sanchar Nigam Limited (BSNL) is the most aggressive when it comes to fighting competition these day. Every alternate day we hear a new Plan or Pack from BSNL which are quite attractive and today also BSNL is introducing new Prepaid Plan taking directly on Reliance Jio. 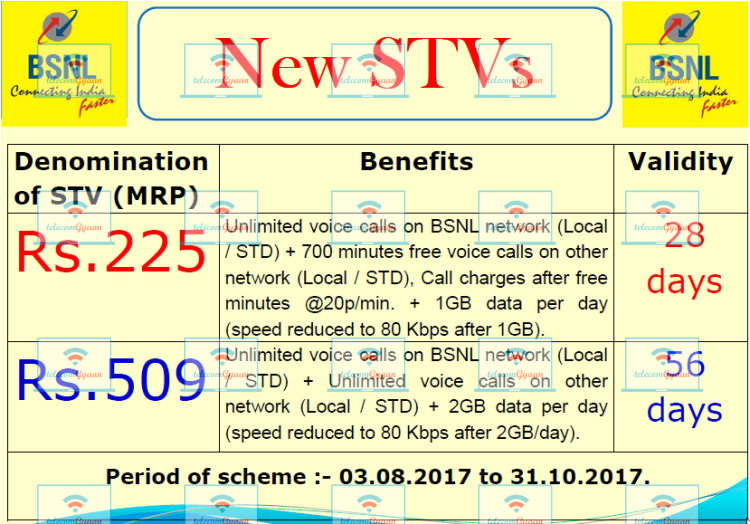 BSNL has introduced 2 new Unlimited Plans, the BSNL 225 Plan and BSNL 509 Plan. Both the new plans are already live in Gujarat telecom circle circle and might be extended to the country soon. Lets start with the BSNL 225 Plan, BSNL is offering Unlimited Local & STD calls on BSNL network, 700 mins for Local & STD calls on other network and daily 1 GB data per day for 28 days. And now the BSNL 509 Plan, it is a direct take on Reliance Jio 509 Plan as it offers exactly the same benefits such as Unlimited Local & STD calls on any network along with 2 GB data per day for 56 days. Both the Plans, the 225 Plan and the 509 Plan are available as Promotional Offer from 03rd August, 2017 to 31st October, 2017. Bharat Sanchar Nigam Limited (BSNL) has just a couple of day ago launched 2 more attractive plan, the BSNL 378 Plan offering Unlimited Local & STD Calls on BSNL network, 30 min daily for other network along with 4 GB data daily for 30 days. For data lovers, BSNL is already offering Plan 548 offering 5 GB data per day for 90 days in Rs. 548 and BSNL Triple Ace 333 Plan offering 3 GB date per day for 56 days and BSNL Chauka 444 Plan offering 4 GB data per day for 90 days. You can check all BSNL Unlimited Packs on this page.